As far as autonomous driving goes, it’s still a bit of a freaky concept for most of us—whether we can trust the cars to detect objects, stay in their lanes and, oh, not kill us. In a test of the autopilot sensors on the Tesla Model S that included things from stuffed animals to kids, a YouTube user found some odd results. Testing of the Model S summon feature—an update to the autopilot capabilities on the car that came out this year—started with a stuffed animal, which the car failed to detect. The unapologetic Tesla smacked right into a poor, stuffed duck. The YouTube user conducting the test, KmanAuto, then mentioned the duck’s low mass and ability to absorb to sound, which is an understandable reason for why the sensors could have missed it. A higher-mass bucket replaced the duck for the next test, and the car yet again went charging forward. This time around, the front autopilot sensor did not pick up on the bucket at a 12-inch range as it should have done—from what KmanAuto says in the video, it’s unclear whether the car stopped itself with an inch to spare or if he did it manually. 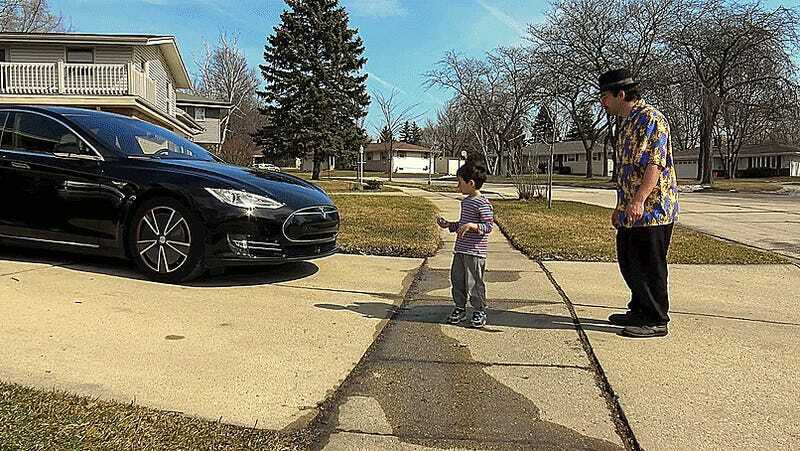 One of the later bucket tests was successful, and the Tesla did manage to sense both humans afterward—child and adult. With all of the curiosity surrounding the future of autonomous cars, it’s interesting to see where the current ones succeed and where they may need some work down the line. There’s also an important lesson here for current and future Tesla owners—the kids should be safe in the path of your car, but just remember not to leave the toolbox out on the garage floor.